The character pictured above is Little Miss Hayden, and she makes me very happy. She also makes me laugh out loud quite often. It's never a dull moment with my darling daughter. She made a Mother's Day card for Mrs. Shife, and I don't know if you can see all the questions and answers from the photo. I will provide a written transcript because it's definitely worth sharing. 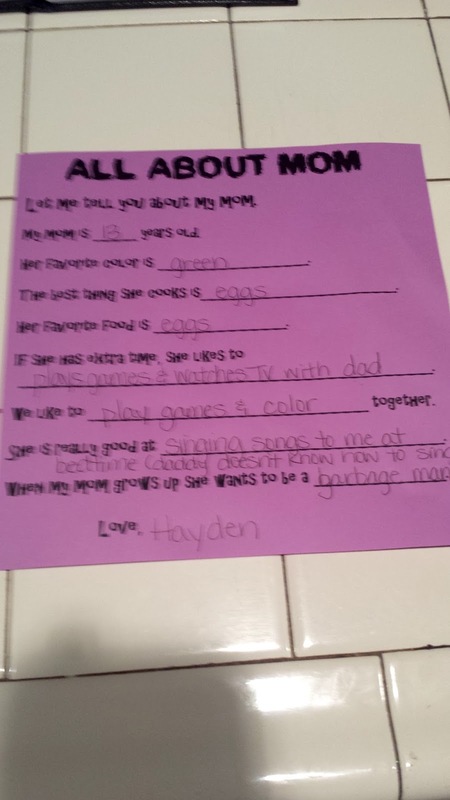 The underlined items are what Hayden had to say. Her favorite food is eggs. If she has extra time, she likes to play games & watches TV with Dad. We like to play games & color together. She is really good at singing songs to me at bedtime (Daddy doesn't know how to sing). When my Mom grows up she wants to be a garbage man. The last two answers just crack me up. I know how to sing ... poorly. It's just better for everyone involved that I don't do it. I asked Hayden why she thought Mrs. Shife wanted to be a garbage man and she just said she likes to pick up garbage. Can't argue with that logic. That is hilarious and sweet. I loved reading my kids' answers to things like that. Little kids are completely honest and it gives the adults in their lives another insight into their young minds. Happy Mother's Day to Mrs Shife. Your kids are a wonderful age right now. I think it was Jason, when asked what his Dad does at work answered 'eat lunch'. Absolutely priceless! I love your daughter, she has such a wonderful mind. They did something similar with my son's class. I believe that one of the questions was "Before my mommy had me, she was..." to which he replied "Smaller". Take that as you will. Those are great answers. And if she thinks I am a Doctor, then so be it :) I hope you all have a great weekend. Ha! I hope your wife achieves her goal of becoming a garbageman. Happy Mother's Day to her. happy mother's day mrs shife! is hayden assisting kyle with the omelets tomorrow morning?